10th INTERNATIONAL SYMBIOSIS SOCIETY CONGRESS will be held in 2021 in Lyon, France. Further details will be provided in due course. The ISS Congress is the sanctioned meeting of the International Symbiosis Society and is held every three years. It is the primary international meeting focusing on symbioses, including complex interactions between hosts and their microbiomes. The Congress usually bring together 400 symbiosis scientists from up to 20 nations to present the latest research in symbioses, their ubiquity in nature and their impact on all environments on the planet. 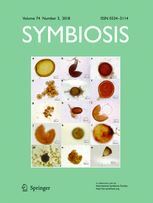 The International Symbiosis Society and Springer publish Symbiosis. Symbiosis is a refereed journal which publishes results of original research that contribute to understanding of symbiotic interactions at the molecular, cellular, and organismal levels. Culture and other specific methods for symbiosis research. 10th ISS congress to be held in 2021 in Lyon, France (dates to be announced soon). The logo was prepared by the artist Malia Mercer and is based on Mauri art describing "an ever changing world and the ability to adapt within it" - a fitting description of symbiosis.